On Monday, April 3, SUNY Buffalo State President Katherine Conway-Turner and Buffalo Public Schools Superintendent Kriner Cash announced plans for the new Urban Teacher Academy at McKinley High School. The Urban Teacher Academy will accept its first cohort of students in fall 2017 at McKinley. Faculty members from Buffalo State and staff from the Buffalo Public Schools will develop the curricula for four college-level courses that will be taught as part of the academy. Academy students also will take part in activities at Buffalo State to help them prepare for college. Students who successfully complete the four-year Urban Teacher Academy at McKinley will be accepted into Buffalo State’s teacher education programs with 12 credit hours already completed toward a bachelor’s degree. School districts across the country are struggling to recruit culturally, linguistically, and ethnically diverse teachers. To develop a more diverse pool of teachers, the Buffalo Public Schools has developed a comprehensive Career and Technical Education “grow your own” program, designed as an opportunity for students who imagine themselves as great teachers. Urban Teacher Academy graduates who earn a bachelor’s degree in education from Buffalo State will be encouraged to apply for positions within the district. Barton, principal of McKinley High School, said, "A program of study such as this is a jewel in Buffalo Public School's crowning opportunities of new and innovative programs of learning. How many times have we heard young children say, 'I want to be a teacher when I grow up?' By establishing the Urban Teacher Academy, in collaboration with Buffalo State, Buffalo Public Schools is creating another pathway of learning, which will allow our students to realize their childhood hopes and dreams of growing up and becoming teachers—in our school community no less." 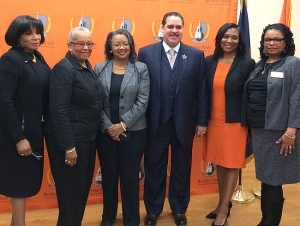 Pictured (left to right): McKinley High School Principal Crystal Barton; Buffalo School Board President Barbara Seals Nevergold; SUNY Buffalo State President Katherine Conway-Turner; Buffalo Public Schools Superintendent Kriner Cash; Buffalo State Associate Dean of the School of Education Kathy Wood; and Buffalo Public Schools Board of Education Member and Assistant Professor of English Education at Buffalo State Theresa Harris-Tigg.